Bonjour Paris. People have dreams about visiting some distant exotic places. Each personality find himself related to a certain place with his sensibility and way of life. We could live somewhere our whole life but our habits and lifestyle could fit more to Spain for example, because we are more emotional and we like to live our lives with our hearths, rather than rationally. Someone else adores tulips and likes to ride a bicycle all the time but he lives on the North Pole for example, and so on. In cases like those, we dream about visiting those place our whole lives so getting there and spending even few days, it’s a real dream come true. Jasmine after many years of dreaming, finally manages to fulfill her greatest dream – to get to Paris, the city of her dreams. Since she was very young, Jasmine was dreaming to visit this city and see all those amazing places that she saw many times on TV or on the internet. She feels like she knows everything about this city, just that now she will see everything in live, for the first time. This girl is on the streets of Paris right now and she starts walking, with an intention to explore every possible corner and taste the smell of the most romantic city in the whole world. This is a real dream come true but she also wishes that dream will last forever! 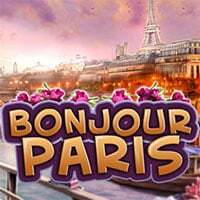 Bonjour Paris is a free online hidden object game on Hidden4Fun.